An image from Mark Hedden's "On the Hook" exhibit opening March 7 at The Studios of Key West. Key West and "liverabroad" Satya looks off into the distance from boat. Cliff lives in Key West and calls his boat his home. Maury has lived in a boat for 6 months. Key West photographer Mark Hedden has long been fascinated by the folks living on boats near Key West's shores, nicknamed the "liveaboards." In 2017 Mark was awarded a Knight Arts Challenge Grant to document the lives of this community. The result is an exhibition "On the Hook," on display now at The Studios of Key West. Mark spoke with WLRN's Luis Hernandez about what leads people to live on the water, the dangers they faced from Hurricane Irma and his experience documenting them. Editorial Disclsoure: Mark Hedden is the husband of WLRN Reporter Nan Klingener. Listen to our interview with Key West photographer Mark Hedden about his new exhibition "On the Hook." WLRN: How do you define what it means to live on the hook? Hedden: You know, we're an island, we're surrounded by water. And there's always been a boat community off the edge of Key West. I mean as long as there's been a Key West, there's been people living on boats around it. And one of the big issues in Key West is affordable housing and it's definitely that. But it's also kind of a more adventurous way to live for a lot of people. How did you approach them? How did you convince them to let you turn your camera on them? Well, pretty carefully. This is Florida, land of "Stand your Ground," and I'm not sure totally how that applies on water, but I went about it pretty carefully. At some point I realized you can actually knock on people's boats. But that took me a couple of months to figure out. And mostly I would go around from boat to boat and look for people on deck and strike up a conversation with them and eventually ask if I could take their picture. Ninety five percent of them said yes. I mean it can seem like a forbidden community, but it's not. Hold on, knock on boats? Please help me understand how you do that. You kind of drive your boat very slowly up to their boat and you knock on their hull. And hope they hear it or their dog hears it. 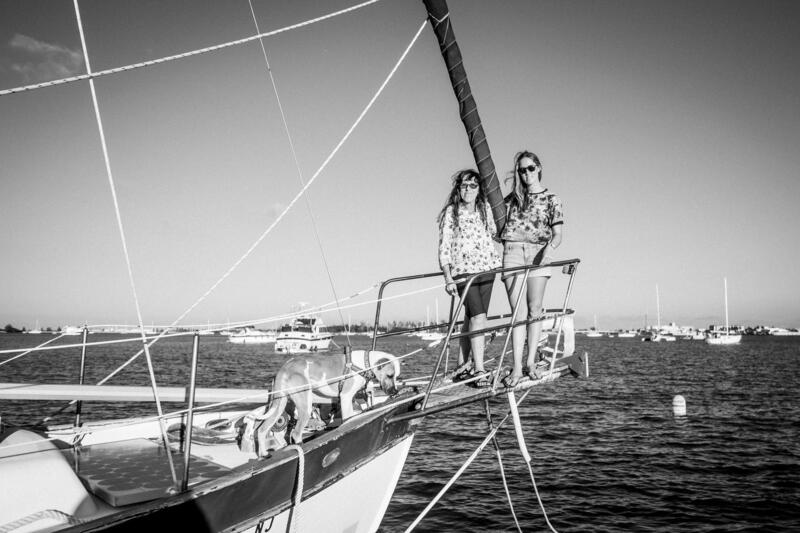 Pascale and her daughter Lani show Key West photographer Mark Hedden their home. You photographed a mother and daughter who live on a boat and the daughter actually, she's spent her whole life on it. And that happens -- I've known a bunch of kids who have grown up that way. They tend to be very well-adjusted kids that you can throw into any situation and they'll be fine. But that's Pascale, she's a Montessori teacher down here, which I mean in a small town that's kind of like being a celebrity. And you know, she's spent 20 years out there raising her daughter and her and her parents aren't together anymore. And what prompted her to do this, to have that kind of lifestyle? It was straight up affordability for her. You know Key West, it's Manhattan rents for real estate and it's hard to earn that kind of money. So I mean it's the way a lot of people make it, but it's also just absolutely beautiful out there. How many of the people you ran into [said] it's about the affordability and it's just cheaper to live on a boat? Yeah I mean [for] some people that affordability is a necessity. Some people are not wanting to spend that money on rent. You know, spending it on the opportunity to travel or things like that. There's a woman I photographed named Sathya, she works at Blue Heaven, one of the great restaurants in Key West. Her whole thing is she wants to be able to travel when she's ready. And so she's got this boat, she's got it all fixed up and she's kind of just looking for the next port eventually. There are rules on where you could park your boat. Help us understand where these folks actually park their boats and where they are living. Well some of them are dictated by the military. Some of them are dictated by private property and some of them are dictated by nature. The water has to be deep enough that your boat's not going to drag or run aground when the tide goes down. But if it's too deep you're subject to pretty big tidal flow. So there's that. There's a long place called Fleming Key, which is attached to Key West and it's a big navy base. It's an ammo dump and people just tend to periodically keep their boats up close to it. And then the Navy has to go out and basically brush everybody back and get them to reanchor further out. So therefore the people who have longevity out there tend to be the ones who are closer to the island.